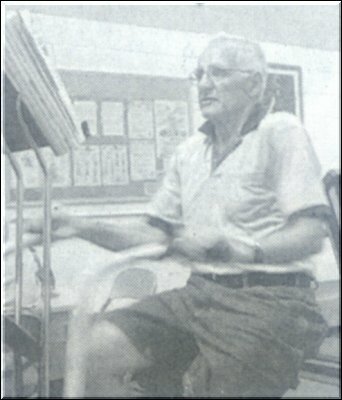 Dr. Philip Ades can hear the whir of treadmills and stationary exercise bicycles from his office at Fletcher Allen's Cardiac Rehabilitation Center. If he leans back from his desk a little, Ades can watch cardiac patients, many overweight, trek into the center's workout room. The average patient rebounding from a heart attack or other cardiac event spends about three months exercising at the center, which is tucked into an upstairs corner of the University of Vermont's Patrick Gym. During that time, a typical patient loses 2 pounds of fat and gains 1 pound of muscle. The exercise regime makes only slight changes to patient's blood pressure or cholesterol levels. Patients who are overweight enter and leave the program largely unchanged. Ades often jokes with patients in their exit interviews. He tells them that they should go through the program about 60 more times to achieve the weight loss he wanted to see. "Their obesity has led them to be here in many ways," Ades said. "I felt that were failing them from the cardiac risk view. "It's not their fault. We needed a better program to help them." Ades has posed a question that few others in the cardiac rehabilitation field have asked: Would weight loss in obese cardiac patients decrease their risk of future cardiac problems? With the help of a $1.5 million grant from the National Institutes of Health, Ades has set up a four-year study to seek answers. It is the first study of its kind. "Everyone's looking for the magic pill," said Ades, who is both a professor at the UVM College of Medicine and a cardiologist at Fletcher Allen. "Yes, it would be nice to have an obesity pill. No, 80 percent of our patients wouldn't be able to afford it. Larry Leach of Fairfax works out on a treadmill at Fletchrer allen Health Care's Cardiac rehabilitation center at the University of Vermont's Patrick Gymnasium. 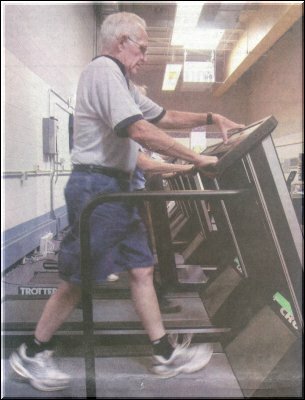 On a recent afternoon, Larry Leach trotted along on a treadmill at the rehab center. The 71-year-old Fairtax man is among the first few of an eventual 88 participants who will take part in Ades' study. The survivor of two heart attacks, Leach was approached for the study because he had gone through the cardiac rehabilitation center after his second heart attack in the mid-1990s. "As soon as I got the letter, I thought, 'Geez, that's a great opportunity:" Leach said. Weighing just under 200 pounds at the beginning of his participation, Leach leads anything but a sedentary lifestyle. He square-dances several nights a week and swims most Saturday mornings. He cut fat out of his diet after his first heart attack in 1975 and stopped smoking, too. His weight once dropped to 140 pounds, and he sported a 32-inch waist for about a year before leveling off at 160. Leach had a second heart attack in the mid-1990s. His weight crept upward gradually, the result of too much fast food and a few too many ice cream cones. He exercised, but he couldn't shake the excess weight and kept going up the notches on his belt. "You can't wonder what you have to do to get healthy and stay healthy:" Leach said. 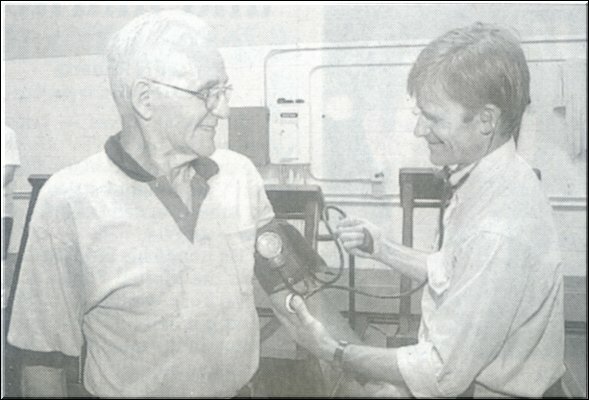 Patrick Savage (right) takes Larry Leach's blood pressure after his workout at Fletcher Allen Health Care's cardiac rehabilitation center at the University of Vermont's Patrick Gymnasium. Ades said Leach's story is familiar. Cardiac patients have looked death in the eye, Ades said, and some want to make as many changes as they can to lead a healthier lifestyle. That's admirable, Ades said, but patients then often go on to ignore how much they eat. Ades said doctors often overlook the issue, too. "To change dietary quantity is asking a lot," Ades said. "I think the reason doctors don't focus more on weight is because they don't have a tool to help them." The subjects in Ades' study will be followed for a year. For the first four months, participants are divided into two groups. One will do high intensity exercise several times a week at the cardiac rehab center for short periods. The other will do lower intensity - such as a slow, easy walk almost daily - splitting their exercise between the center and home. Larry Leach of Fairfax works out on an exercise bike at Fletcher allen Health Care's cardiac rehabilitation center. During that time, both groups will watch what they eat. With the help of registered dietitian Maryann Ludlow, participants will count calories and examine how much, when and why they eat. Patrick Savage, the study's coordinator, said the dietary counseling trims about 500 calories from a patient's normal daily intake. The study doesn't set a particular goal of pounds to be shed. Instead, Ades wants participants to recognize where their dietary pitfalls are and look for ways to avoid them. For some, it will be no snacking in the middle of the night. For others, not eating when emotions run strong will be a challenge. "There's nothing harder than changing known behaviors," Ades said. Savage hears about the struggle every day in the cardiac rehabilitation center where recovering patients and study participants share the facilities. Food is a big deal for both groups, Savage said. "Ninety percent of the conversations that happen on the treadmill revolve around food," he said. "Food is just so plentiful and cheap that it's hard to overcome the temptation that's out there." Leach thought he was doing a good job watching what he ate. Then he joined Ades' study. Recording his calories opened Leach's eyes to just what his Saturday morning, post-swim snack meant. "It was shocking what that bagel and cream cheese does," Leach said. When Leach completes the four-month exercise portion of the study, he will remain in contact with Ades and Savage. He will spend the fifth month on his own, exercising and putting on a slightly more generous daily calorie count. After that fifth month, Leach will undergo many of the same tests he did at the beginning of the study. Ades is interested in the changes to Leach's body beyond his weight. Tests will measure Leach's cholesterol,both good and bad, protein as well as his body's resistance to insulin-an indication of the tendency to become diabetic. The study also will record any cardiac events - chest pains, bypasses, heart attacks-experienced by the participants. Then, for the next seven months, Leach will meet with the study leaders once a month to review his diet. Ades hopes that Leach and other participants will continue to fend off weight gain, but participants are left to their own choices. At the end of a year, participants will undergo their third and final battery of tests. "When they're on their own,"Ades said, "they really have to say, "I have to take responsibility for this. They've given me the tools." Ades said about 8,000 people in Chittenden County have had heart problems. About 80 percent of those people are overweight, Ades said and about 75 percent of those cardiac patients refuse to make changes that would help them live healthier lives. "I don't honestly, fully understand why," he said. "Is it too much to change all at once?" If the study proves that the risk of future cardiac events can be reduced through exercise and moderate dietary changes, Ades would like to create a program other hospitals could adopt to help the 250,000 cardiac patients nationwide. Almost nine months into the four-year study, subjects are losing an average of 15 pounds during the four months of exercise. "Everybody seems to be losing weight," Ades said. Leach has already reaped benefits. The study has helped him lose 25 pounds, but he'd like to lose 15 more. His energy has increased, a sign for Leach to push himself to do more. And, he has started to edge back down the notches on his belt. "People are noticing," Leach said. "I've got some smaller pants. "And, actually, sometimes you feel too full."